At Paralympics, Blind Long Jumper Relies On Teamwork : The Torch Lex Gillette, blind since childhood, competes with help from guide Wesley Williams. "Jumping into the air, it's like someone opens up this cage door and I'm able to go out and be free," Gillette says. 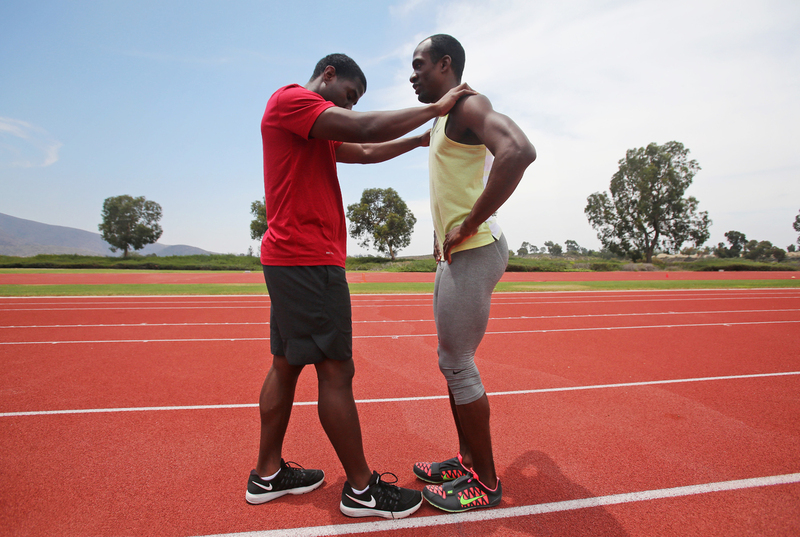 Guide Wesley Williams (left) lines up blind long jumper and sprinter Lex Gillette on the track before making a long jump during practice at the U.S. Olympic Training Center in San Diego. Gillette started losing his sight when he was 8 years old. So for the next 11 days, the focus should turn to the more than 4,000 athletes with disabilities gathered for the games. And for at least one of the expected stars, individual success will depend on teamwork. Gillette lands a long jump. At 17, Gillette won his first long jump national championship. Two years later, still a teenager, he won the first of three straight Paralympic silver medals. You might have heard by now: Paralympians don't want your sympathy. They want you to see them as self-sufficient, high-achieving athletes. Just like the ones who recently dazzled at the Olympic Games. But sometimes a Paralympian can't be just like. For instance, American long jumper Lex Gillette. He's blind. He couldn't have won silver medals in the past three Paralympics in 2004, 2008 and 2012 — or soared more than 22 feet to a world record — without help. For the past nine years, Wesley Williams has been Gillette's helper. 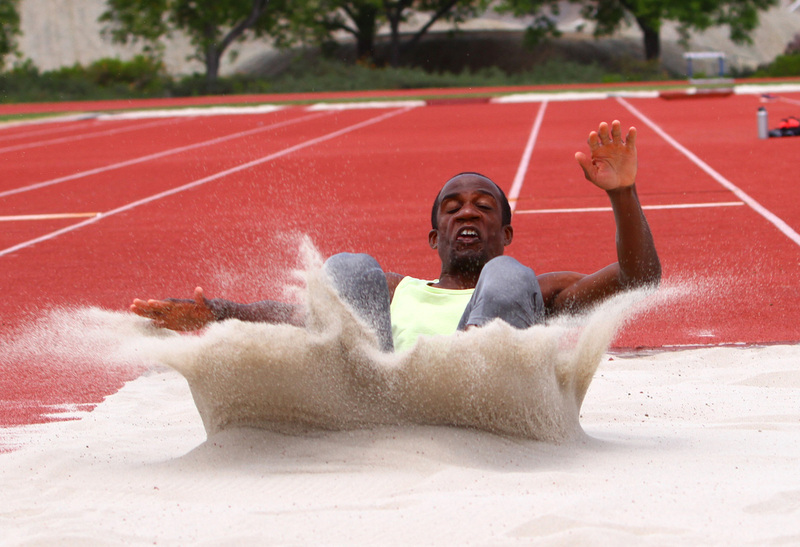 On a summer day a couple of months before the Paralympics, at the Olympic Training Center in Chula Vista, Calif., Williams stood near a long jump sandpit, clapping his hands and calling out to Gillette with each clap. "Fly, fly, fly, fly," Williams said to Gillette, who stood 80 feet away at the head of the long jump runway. Williams was Gillette's beacon. He gave him a precise spot to run to. Moments before he started the "fly, fly, fly" chant, Williams stood next to Gillette, positioning Gillette's shoulders and feet to make sure he'd run straight at the pit. Gillette did — with no hesitation, and with great joy. "I was kind of enclosed by people's expectations," Gillette said later. "But when I'm on the track and I'm running down the runway by myself and jumping into the air, it's like someone opens up this cage door and I'm able to go out and be free and do my own thing." Wesley Williams and Lex Gillette go on a warmup run. For the past nine years, Williams has been Gillette's helper. Before he could fly, Lex Gillette had to reconfigure a world that started going dark when he was 8 years old. He remembers one night as he was about to take a bath, he realized he was having trouble seeing. His mom flushed his eyes with water, but it didn't help. The next day, a doctor told them Lex needed emergency surgery for detached retinas. His vision cleared after the operation, but three or four weeks later, the problem returned. And then another surgery. "That was the pattern for the entire time I was 8 years old," Gillette says. "After the 10th operation, the doctor said they couldn't do anything else to save my sight." When he became totally blind around the age of 10, "It was crazy because you feel so isolated and alone," Gillette says. "At that age," he says, "the first thing that went through my mind was not being able to play video games and not being able to play outside with friends. Not riding a bike. Then not seeing my family. My mom, her facial expressions, her smile. That was really a difficult moment for me." Gillette credits his mom, Verdina Gillette-Simms, with helping him get through the fear and sadness. She kept him in public schools so he'd interact, for the most part, with sighted kids and adults. She got someone to teach him Braille and how to use a cane. "Once I was introduced to those resources," he says, "my confidence boosted a lot." His mother also urged Gillette to set and achieve goals. "I'd challenge myself to walk around and not bump into things. Then I moved outdoors." He summoned the courage to go back outside and play with friends. That helped him regain a sense of physical balance and spatial awareness. By the time Gillette hit high school, his athleticism flourished. "I had a teacher who noticed I was really good at different exercises," he says, "like push-ups and pull-ups and sit-ups." He also discovered he was good at jumping. First in the standing long jump. Then, out on the track, down the runway — and flying. At 17, he won his first long jump national championship. Two years later, still a teenager, he won the first of three straight Paralympic silver medals in Athens. 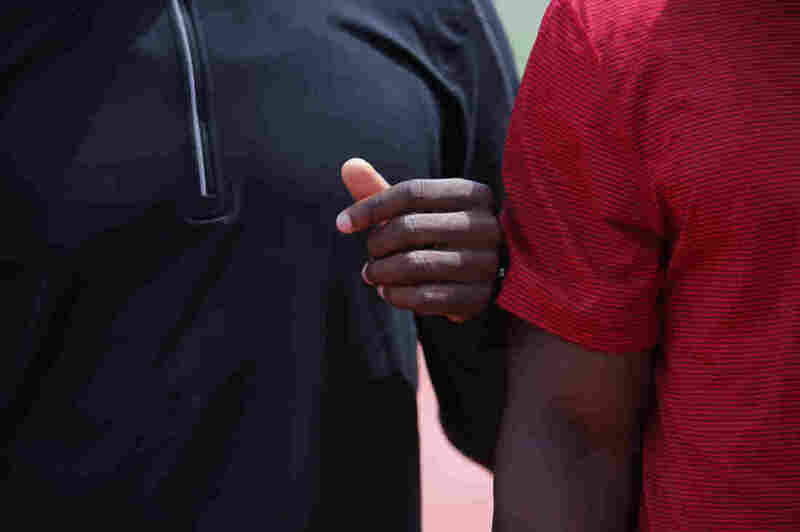 Gillette (left) is often touching his guide Wesley Williams as they walk around the grounds during practice. Gillette also races in the sprints. His best time in the 100 meters is 11.29 seconds. 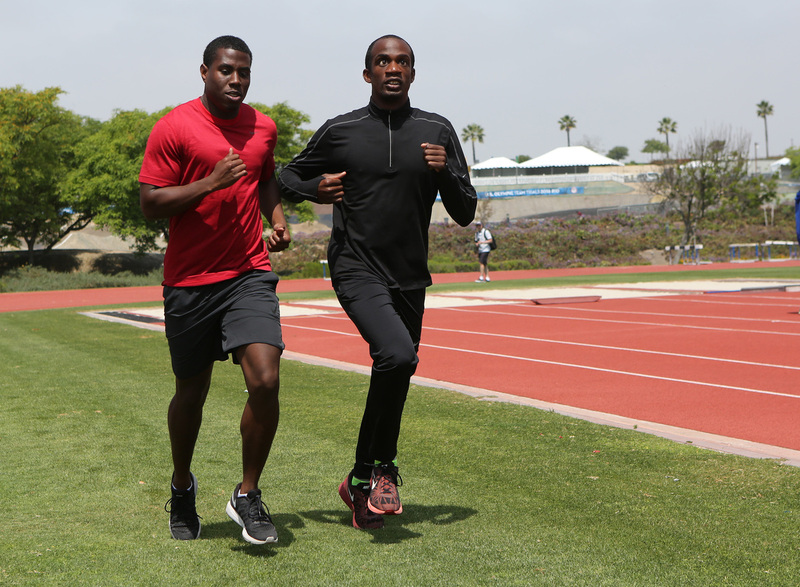 On the training day in Chula Vista, he and Williams practiced 50-meter bursts. Williams was a sprinter in college who ran the 100- and 200- meters. It showed, as he and Gillette barreled down the track side by side. In a race, they're tethered together by a short cord. At practice, they're barely touching — but touching just enough. "The more and more we started working together," Williams says, "we have like elbow-type of communication. So when we're on the curve, I'm just tappin' elbows. I let him know, hey, we're at the 50-meter mark; hey, we're running up on the 75-meter mark, if we're running anything far." "So I'm just speaking when it's needed, rather than the whole time — 'Let's go! Let's go! Let's go!' — like a cheerleader. I just can't do it," Williams says with a laugh. Gillette appreciates the nonverbal communication as well. He says they've built an unbreakable trust over their nine years together. "It's like we are one unit," he says. "It's such a fluid movement and, yeah, I mean, it's incredible." Gillette stretches during practice. "I was kind of enclosed by people's expectations," Gillette says. "But when I'm on the track and I'm running down the runway by myself and jumping into the air, it's like someone opens up this cage door and I'm able to go out and be free and do my own thing." On Thursday morning at Rio's Olympic Stadium, Williams will be there next to the long jump pit, helping Gillette zero in on the target — clapping, urging Gillette to fly. They hope the crowd is respectfully quiet, allowing guide and athlete to verbally communicate. Once Gillette has located Williams and knows where the pit is, he'll start his sprint from more than 100 feet away, count his strides and launch on the 16th stride. If all goes well, Gillette hopes to break his streak of Paralympic silver medals and win gold. If he does, Williams won't get a medal. Guides don't get medals unless it's a running event. But in both their minds, Gillette's prize will fit around two pairs of shoulders.